This point was named for the defensive cannon placed here by French troops in 1808, though some locals still refer to this scenic spot as the "Piazzetta degli Artisti" after the German painters who would set up their easels here in the beginning of the 19th century to capture the view on canvass. You reach the point by following an urban itinerary along a pretty pedestrian lane with stretches of stairs which climb slowly uphill to the castle. Before beginning your walk, take a minute to explore the area known by islanders as "Santa Teresa", where there is one of the largest monasteries on Capri. You can visit the Church of San Salvatore (today unconsecrated) and the small private cloister of the Theresian Convent, which are what remains of the historic complex. Once you begin your walk under the porticoes of Via Castello, you'll notice picturesque "Vicolo degli Urtanti" which marks what was once the outside boundary of this large monastery. After passing Vicolo degli Urtanti, the lane begins to climb up to Punta Cannone. It doesn't take long to reach, and the stairs are much less strenuous as they may seem; the final stretch of the trail is flat. It is along this final stretch that you catch your first glimpses of the spectacular center of Capri spread out below; in just a few meters, you will reach Punta Cannone. 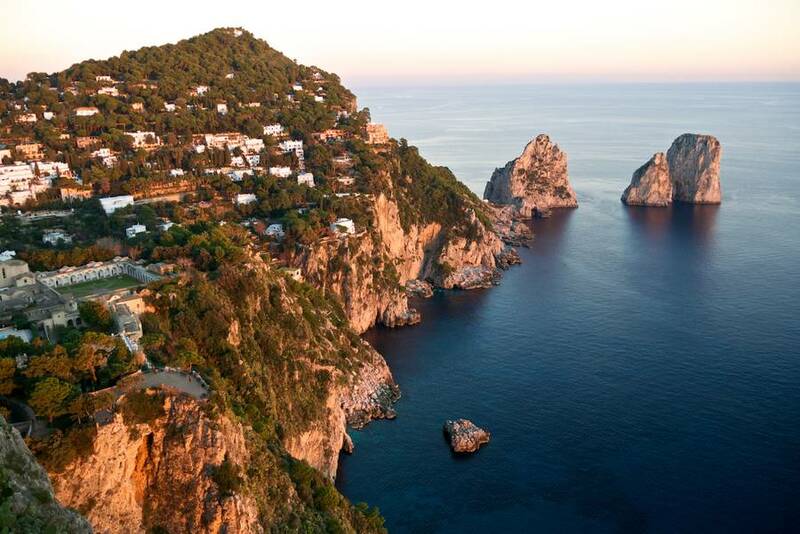 Here, suspended between sea and sky, you can savor the sweeping view over Capri town and the Gardens of Augustus, taking in the Faraglioni sea stacks and Via Krupp, and even Via Tragara and Marina Piccola. You will be left breathless at this unique view, and immediatly understand why this was such a favorite spot for artists over the centuries! Duration: approximately 20 minutes from the Piazzetta. Gym shoes are recommended, though you can also wear comfortable walking sandals. A camera is a must, but bring your paints if you are an artist!